We are pleased to introduce a major release for this month including customer requested features and improvements to SalesHood. Please email us at support@saleshood.com with any questions. Over the next few months, we’re focused on refining and tailoring the SalesHood experience to for ease of use, navigation and content creation. We made updates to the SalesHood web application homepage clarifying what to do next, what’s important for the company, and what you’ve completed. We updated the To Do section (previously “Featured”), Completed Items, Learning Paths, Pinned Items, and Popular/Team video feeds (previously “Trending”). Previously titled “Featured,” this section shows your assigned Huddles and Pitches, sorted by due date. We moved Pinned items out of this section so there’s no confusing what you have to do next. This section also contains Open Huddles you’ve started but haven’t completed, so you can pick up right where you left off. (NOTE, pinned items you’ve been assigned to will appear here. Once completed, they will live in the new Pinned section, more below). Behind To Do is a tab containing the Learning Paths, Pitches, and Huddles you have completed, sorted chronologically. This tab also contains past events you’ve hosted (if applicable). Note that both the Completed and To Do tabs are paginated to cut down on clutter. Second, by default we show you only Programs you have yet to complete. 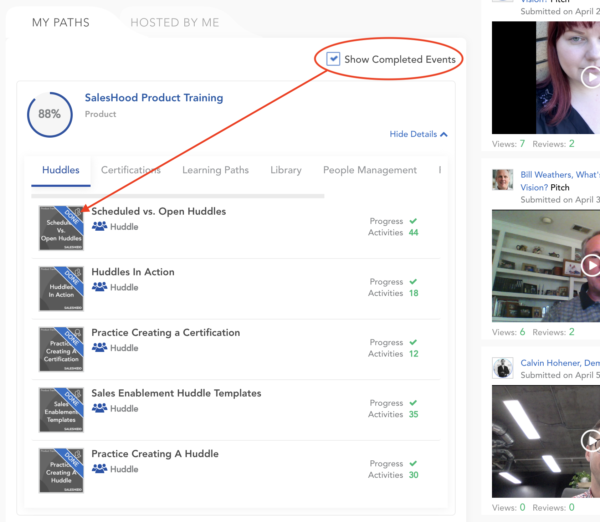 Check the “Show Completed Events” box to display the complete history of programs in the Learning Path. Once you complete a Learning Path it will will live in your Completed tab. Pinned items are a great way to ensure content is visible across your company and teams. Pinned items work as you’re used to, but have been moved from the former “Featured” section to the right-hand side of the screen. Your list is paginated to help you organize and prioritize your pinned content. The Popular and Team video feeds are a great way to expose best practices. The Popular feed displays your company’s most viewed videos on a 7-day rolling basis so this content never gets stale. 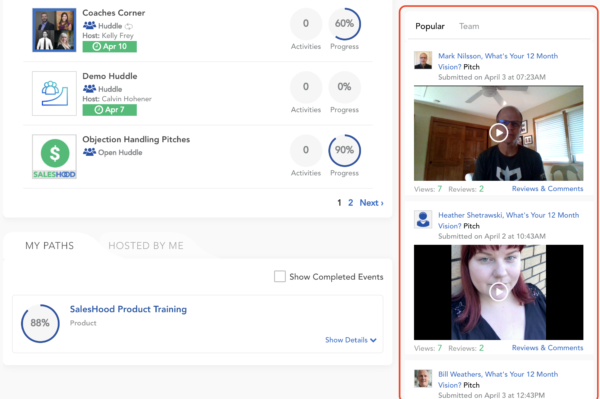 The Team video feed shows the same thing but for the people you manage or the peers on your team. 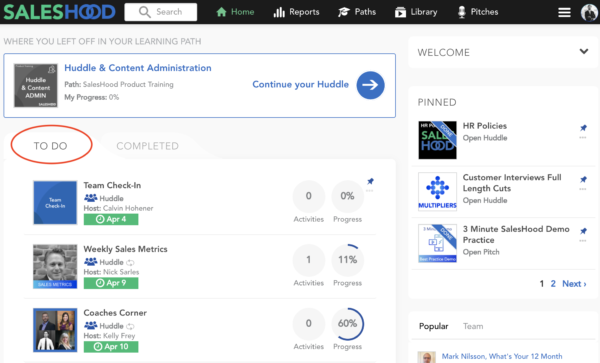 We’re streamlining the process of creating Learning Paths, Huddles, and Pitches in SalesHood. 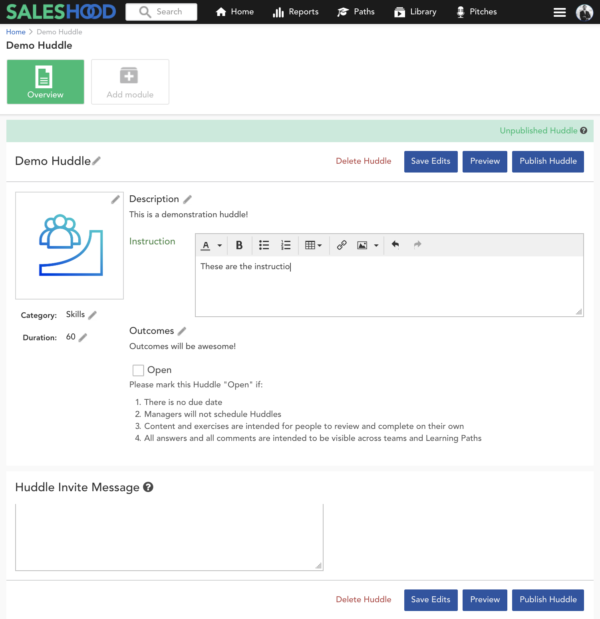 This release, we made the Huddle creation flow simpler and more similar to creating Pitches and Learning Paths. 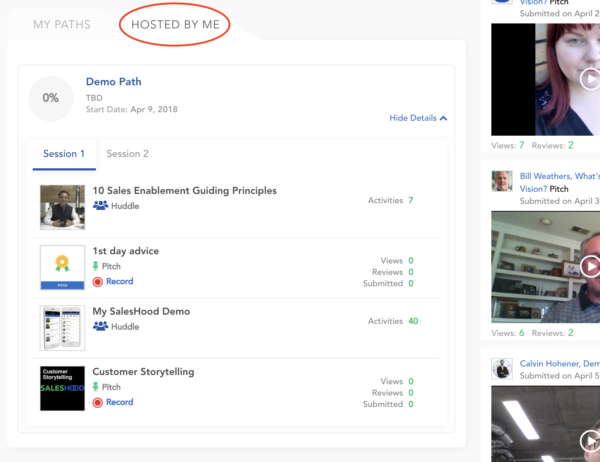 You can now create any type of content from wherever you are in the SalesHood web app. Access “Create Content” from the hamburger menu to initiate any type of content creation from anywhere in the platform. 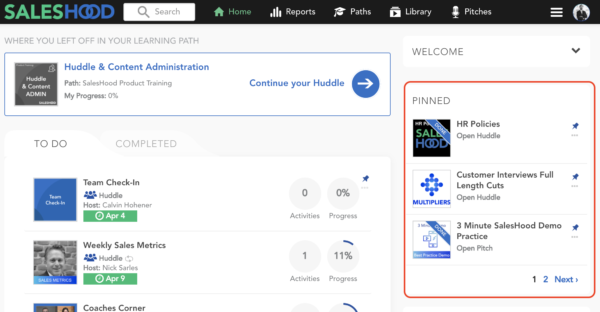 Now, after choosing to create a Huddle from the Library or the Content Creation Shortcut, just enter the name of the Huddle and whether you want it to be open or scheduled (you can change this any time prior to publishing the huddle). After entering this, you’ll be shown the layout of a huddle as seen by participants. You can edit information and add all module types like you would normally. You can also add supporting documents and change the huddle from Open to Scheduled at any point prior to publishing. All fields are editable in-line. 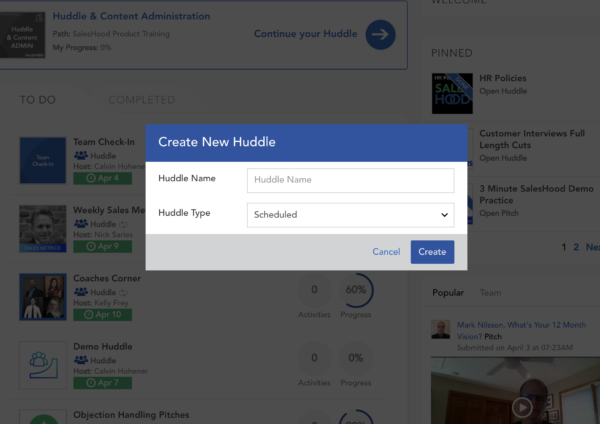 You can also change the huddle between Opened or Scheduled any time before you publish the huddle. Add modules in this view as well – creating individual modules is the same as it’s always been. Once you’re happy with your edits, click “Publish” to publish the huddle. 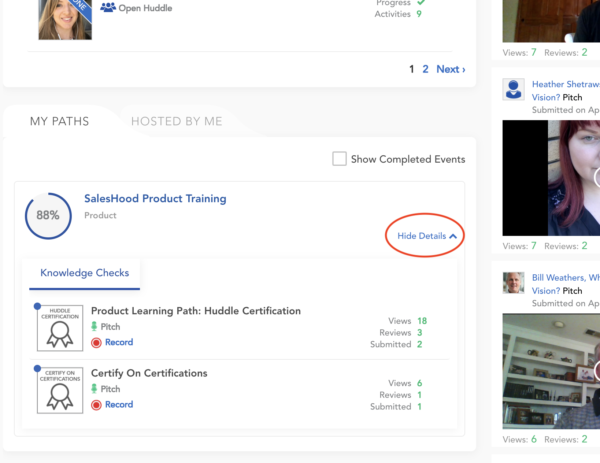 Once that huddle event is live, you can add participants and set its schedule (if a scheduled huddle). All unpublished huddles will still be stored in the Huddle Publisher. Have you always wanted your SalesHood experience to be branded with your company colors and logo? You now have that ability with our Company Theme Builder. 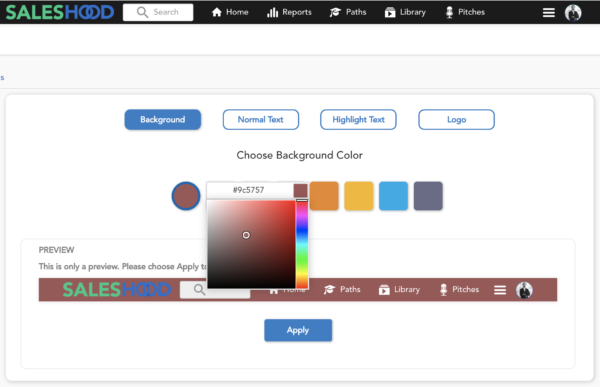 Select the colors for the in-app experience (both web and mobile) and upload your logo for a branded learning experience. Want to add branding to your SalesHood experience? Talk to your SalesHood Account Executive to learn more. This release, we’ve updated our User Report to show progress and engagement metrics in a cleaner and more intuitive format for companies and teams. We are working hard to get even more customer requested features out. Stay tuned by checking back at support.saleshood.com or email us at support@saleshood.com.